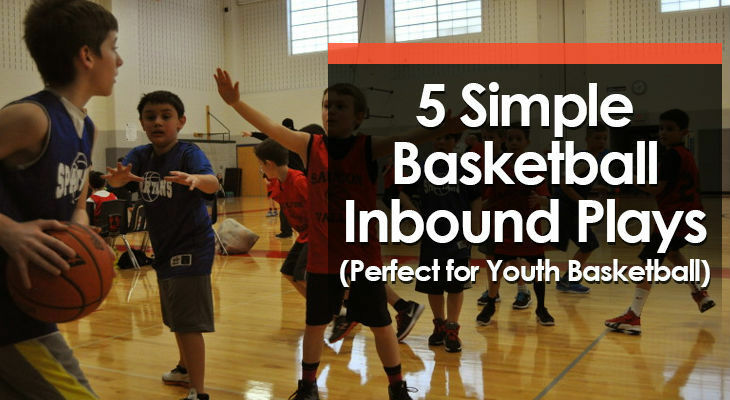 Getting young players free for open shots off an inbounds pass isn't easy. To do so, you need to have basketball inbound plays that are simple for young players to understand and easy for them to execute. If executed correctly, all of these plays will give your players either a wide open jump shot, or a shot close to the basket where they'll potentially get fouled while shooting. Simple play to get the team’s best scorer attacking the basket immediately off the inbound pass. 3 should be a player able to throw a precise pass. 2 should be a player able to finish strong at the basket. The play starts with 1 and 5 cutting up to the slots off screens from 2 and 4 around the elbow areas. As soon as they’ve gone past the screens, 2 cuts around a screen from 4 and curls towards the basket to receive an inbound pass and finish with an open layup. 4 must look to set strong screen on 2’s defender, making sure to set it on the correct angle to create separation for 2 to receive the pass and finish. Make sure that 4 shows for the pass after setting the screen for 2, as sometimes 4’s defender could help on the cut from 2. This play is designed to catch the defense off-guard and won’t work if you run it too often. Save it for special occasions. This basketball inbounds play from the baseline is designed to quickly get the team’s strongest post player (or a player with a significant mismatch) close to the basket for an inbound pass and finish. 5 should be the team’s strongest post player. 3 should be the player capable of setting a strong screen. 1 should be the team’s best passer. Setup: The play starts with three players across the free-throw line and one player under the rim with the team’s best passer throwing the ball in. The play starts with 2 and 4 cutting opposite directions to behind the three-point line to drag their defenders away from the middle of the key. As this is happening, 3 sets a screen for 5. 5 must read the two defenders and cut towards the hoop looking to receive the pass from 1. It’s very important that none of the player give away where they’re going to cut too early. Get players to face different directions to throw the defense off. As long as everyone knows which player will receive the screen at the free-throw line, encourage some movement to keep the defense on their toes. 3 must set a strong screen and hold it until 5’s defender has evaded it. This quick hitter is designed to create a scoring opportunity right off the inbound pass, with either an open layup using a back screen or a perimeter shot for the team’s best shooter using the elevator screen. 2 should be able to knock down perimeter shots at a high percentage. 3 should be able to finish under the basket. 4 and 5 must be able to set solid screens. Setup: The play begins in a box formation with the bigs on the strong side. 2 starts the play by cutting under the basket, then turning towards 3 and setting a back screen on 3’s defender. 3 cuts to the basket looking to receive an inbound pass. Immediately after setting the back screen for 3, 2 cuts between 4 and 5 who “close the gate” and set an elevator screen on 2’s defender. 1 inbounds the basketball to 2 who should be open for a midrange or three-point shot. Make sure your best shooter starts on the low block opposite from the in-bounder. 2 must cut to about under the basket before turning towards 3 to set the screen. This ensures the screen will be set on the correct angle. 4 and 5 must close the gap immediately as 2 runs through to stop 2’s defender. This is one of the plays you can use when you have only a few seconds left on the clock. This basketball inbounds play is designed to create good spacing for a pick-and-roll situation immediately after the inbound pass. 1 should be the team’s best creator out of the pick-and-roll. 5 should be the post player able to set strong screen and roll to the basket quickly. Preferably, 2 and 4 can hit a three-point shot from the corner. The play starts with 2 and 4 setting down screens for 1 and 5 at the same time. After setting the screens, 2 and 4 clear out to the corners. 1 pops out to the ball-side slot off 4’s screen to receive the inbound pass, while 5 sprints towards 1 and prepares to set the on-ball screen. 3 enters the court to take the wing position. Immediately after 1 receives the inbound pass, 5 sets the pick-and-roll screen on 1’s defender. 1 drives towards the basket through the middle of the key and looks to score, or pass to either 5 rolling to the basket, or one of the players outside for a 3-point shot. All three players outside must be ready to shoot on the catch. 5 must sprint to the top of the key to set the screen. If they do, 5’s defender will usually be late and won’t be able to help properly on 1’s drive, which allows them to attack the hoop with speed. Make sure that 5 sets the pick-and-roll screen on the correct angle that allows 1 to attack the rim. This play is designed to get a layup off the inbound pass after creating some confusion and then setting a back screen for one of the players. 4 and 5 should be players that can finish around the hoop. 1 should be a good decision-maker and able to throw a precise pass. Setup: The play begins with the players stacked along the free-throw line. 2 starts the play by cutting through towards the strong side corner. At the same time, 3 cuts out to the wing. Just as 2 leaves the key on their cut, 4 cuts towards the low block calling for the basketball, then quickly turns around and sets a screen on 5’s defender. 5 cuts off the screen (above) towards the basket closer to the in-bounder, while 4 seals 5’s defender on the screen and looks to receive the pass on the other side of the basket. 1 should look to pass to whichever player has the better opportunity to score. It’s very important that 4 seals 5’s defender on the screen to be able to receive a pass and finish with this defender on their back, since 4’s defender will often try to switch and pick up 5 on their cut to the basket. 4 and 5 should avoid cutting too close to each other and have one defender cover both of them. 4 must be screening 5 with their back towards the basketball. Some kids will set this screen too high and the defender easily slips under it. When 2 and 3 cut, they should be calling for the ball to drag their defenders out with them.